Haven't got a helpful pet ;-) but maybe one of my teddy bears might help, hahaha! Super cute - thanks for sharing! That is the cutest book holder ever!! Cathy - Oh, that is a truly great 'photo! You simply cannot turn the page there. doggie day on my blog today too. Om my gosh ... I am totally in love with that little pooch! Kathy-- I think so, too! Margot-- I think I agree with you! 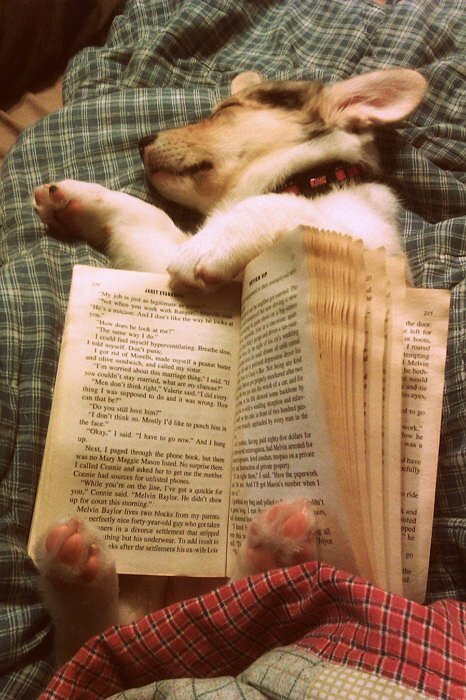 Patty-- I'd be too busy playing or snuggling with the pup to read the book. Besides... I've already read it! PPh.D-- I know! I want a basketful!